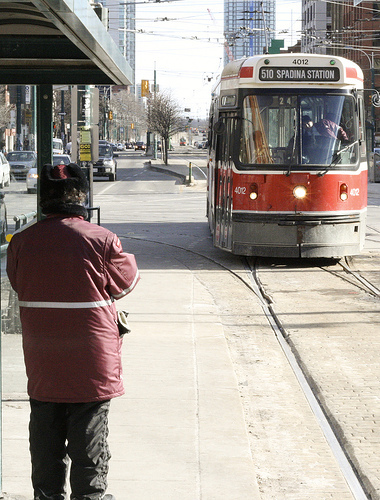 The Toronto Star and Car Advertiser is reporting on its website that the TTC has rejected the contract negotiated by its union boss Rob Kinnear and Toronto Mayor David Miller. Yeah, that contract–the one that “saved” Toronto from a crippling transit disruption just a couple days ago (Sunday night). It was to give them a 9% raise over three years, and some other goodies, but for some reason that didn’t wash with them as drive our buses and trains. After all, they gotta train for what, a couple weeks? Don’t they deserve to earn as much as a nurse or a medical technician? So by the time you read this they’ll be on strike. It’s not going to be pretty. For cyclists, the bump in bike traffic just as the weather’s getting nice could do wonders for our culture. Already, plans are in place to reserve the curb lanes of the Dundas Street bridge over the Don River (yeah that bridge, the one that will cost Toronto Star “Fixer” Jack Lakey his job yet) for bikes, in both directions. Between the wreckage of higher gas prices, the need for exercise, and the joy of riding a bike, a Transit strike at this time can only throw more people into the arms of the most rational form of transportation, cycling. Here at the ALLDERBLOB we’re cheering the clods in maroon. You think they wouldn’t go on strike if they had less dorky uniforms? Strike away, boys and girls. As for cyclists, enjoy your strength in numbers. Let’s all work for a world where everyone can safely ride a bike. UPDATE: Strikers were forced back to work by the province. And in the meantime, NO enforcement of the carfree lanes on Dundas East or Queen’s Quay or any of the other special provisions that were supposed to be established. Pity. Each year at this time Iwe open the local car advertiser and news reporter (aka the Toronto Star, “Canada’s largest newspaper”) to be reminded of how little things change at Canada’s largest car advertiser. Oh, they talk a fine talk about fighting climate change, decrying air pollution, defeating the scourge of obesity and related health problems, etc, but when it comes to the car advertisers who pay their salaries, they cave in every time. Every year at this time, as long as we have been paying attention, the Star has published a feature called “Your First Car.” We have previously likened this to a pusher advocating “your first cigarette” or a gang offering “Your First Murder Weapon.” We have famously [in your own mind at least.–ed.] linked the disappearance of Star geniuses-at-large “Giles Gherson” and “Michael Goldbloom” (not their real names) from the newspaper masthead to our analysis of their “news coverage” in the “Your First Car” advertorial. This year, bowing to pressure from the ALLDERBLOB, the Star has wisely eliminated the section. Hey, Toronto Star: haven’t you heard? There’s a fine line between clever and stupid. You can’t be singing the praises of Earth day on Tuesday and then Thursday go back to selling cars like it really doesn’t matter. People notice this stuff. Wake up! NOW magazine to cycling community: We think you’re cute, we really do. Now get out of the way! Here at the ALLDERBLOB we admire the chutzpah of those who praise our culture from behind the windshields of their automobiles. We really do. To us, they’re like the liberal-minded plantation owners of yore, who held high the banner of freedom for all as long as it didn’t impinge on their freedom to own slaves. Of course with cars, the usual sick Freudian reversal is closer than ever to the surface: just as the sadist is a masochist and vice-versa, the car-owner is in servitude to their “chosen” means of transport, to the tune of many thousands of dollars a year. 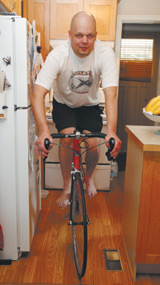 Take Paul Terefenko, for example, who writes in the cover story on how to become a commuter cyclist: “I’ll be wearing a helmet. You should, too.” Nevermind the evidence that suggests cars pass closer to cyclists wearing helmets, actually increasing the risk of a collision. Terefenko also writes: “It’s tough not going through a red light when nobody is around, but Officer Hardass will eventually nab you.” Nevermind research that suggests cyclists that run reds and generally ride more aggressively are less likely to be involved in collisions with cars. Maybe Terefenko should be devoting some ink to the suggestion that the laws around cycling should be changed. We wish his editors had encouraged him to write about what’s laughingly known as The Toronto Coroner’s Rule, or to question why the government refuses to mandate sideguards on large trucks. Nevermind the call to ban car advertisements, which like the ban on cigarette commercials once did might actually have the (ostensibly) desired effect of reducing automobile dependency. * 1. The amount of energy required to supply everyone with a vehicle like this for life would be the same as what America uses in 1 year to keep its cars on the road. * 2. There would be far less pollution, far less degradation of natural resources. * 4.There would be no road rage. * 5. People who choose to walk would not be in danger. But Illich wrote in 1970, and that’s just not “NOW” enough for car dependent folks like Susan G. Cole, who after all may have to “drive to transport small children, large objects or elderly parents.” To which we say, Well, an addict will always be able to rationalize her addiction. Of course, hardly a paragraph or two into her screed, Susan G. Cole brings out the old saw, “We have some things in common, ya know, like we all have to to obey traffic rules.” Nevermind the fact that traffic rules are written with the eye to controlling the horror she takes as a god-given right as a means of personal transportation. Hey, it’s okay to hate cars. Everybody does. That’s what traffic laws are all about. People on bikes don’t kill people. They don’t run over small animals. They don’t cause wars, pollution or food shortages in their claim for fuel. So back off when you see us coming the “wrong way” on a one-way street. We’re there because it’s the sane place to be, under the circumstance. We’re not going to kill you. But you might kill us. SLOW DOWN. (or your kitchen, as the case may be). Hey Susan, About that “moving violation” you committed in order to find a parking space on St Clair. What does that make you in light of what you’ve written here (“we all have to to obey traffic rules”)? Maybe you meant to say: “except when they don’t make sense?” The fact is, for cyclists, most of the time traffic rules don’t make sense. But for NOW magazine and its Car Advertisers, that wouldn’t make “cents” to admit: bikes aren’t filling full page advertisements. We’re not holding our breath for anything other than business as usual from the aging hippies who call the shots on its pages. Here at the ALLDERBLOB(tm) we try to keep abreast of the news at all times and at all costs. Of course, the climate change deniers were all over this one: you can read all about their smug refusal to go along with the attempt to reduce electricity consumption. To climate change deniers, reducing any kind of consumption is futile and smacks of communism. The National Post and Car Advertiser, for example, had a field day with Earth Hour(tm). They carried on as though it was all a goofy plot to instill North Korean-style government the world over. 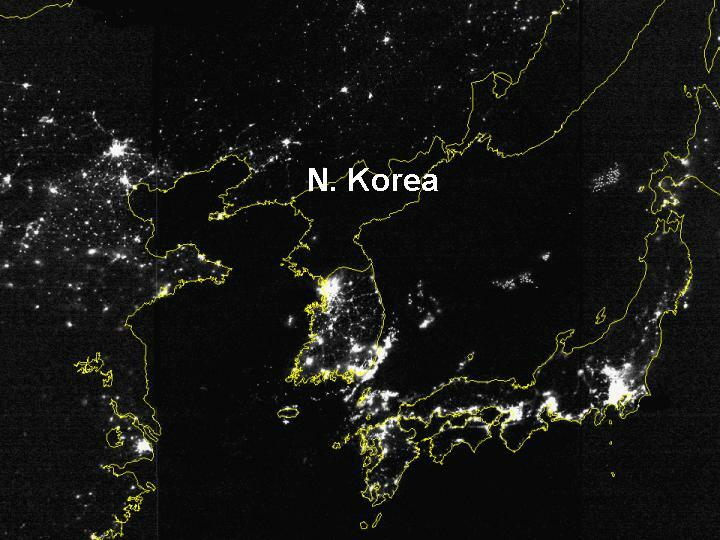 Fact is, for astronomers and just plain folks who like to see the stars at night, North Korea’s probably a pretty nice place to live. Too bad it takes a despotic government and an economy of dire poverty to create these conditions. Too bad we in the west can’t seem to figure out how to make good things (darkness at night) come with other good things (enough food to eat, decent jobs, and healthy citizenry). You are currently browsing the the ALLDERBLOB blog archives for April, 2008.